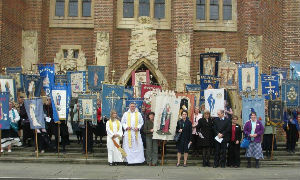 For many years (80 this year in fact) we have had a thriving MU branch as part of the life of All Saints. In recent times the membership has decreased, and it is increasingly difficult to keep running as a branch with a full committee and programme of events. On Sunday 28th April 2019 we are having a Service of Thanksgiving to mark their 80th anniversary as a branch. The members will remain part of the MU, but we are going to enter into a moving on phase and stop the monthly meetings and communion services. There will be a time for prayer, rest, reflection and in time we hope God may raise up a new generation of women (and/or men as they can join too) who want to start a new expression of the MU for All Saints. To acknowledge all that the MU have done over the years including post wedding drinks and cakes, funeral teas, Mothering Sunday flowers, cake stalls, hospital bags, toy bags and so much more we are having a church collection. We then intend to buy a new lectern Bible to mark the 80th anniversary and present it to the MU, who will then effectively present it back to the church for use in our services. Inside the Bible will be an inscription and a list of the names of all the members (we can collate and remember) who have been part of the MU for the last eighty years. If you would like to donate to this collection as a sign of your gratitude to the MU, please place your donation in an envelope in the post box or drop it into Karen in the office. Please do this by the end of February. 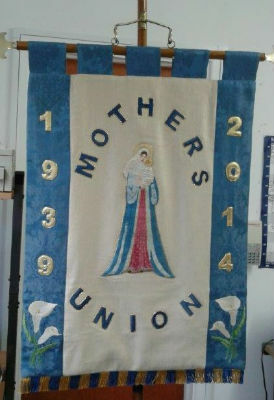 There has been a branch of the Mothers Union at All Saints for over 75 years. It has always been a small membership of people who have a special concern with marriage and family life underpinned by prayer. We celebrated our 75th Anniversary in 2014 with a special service at whichour refurbished banner was re-dedicated. This was attended by the Diocesan President Jackie Atkins who gave a talk on Mary Sumner.The service was followed by a celebratory lunch in the church hall. Every year we attend the Lady Day Service at the Cathedral. 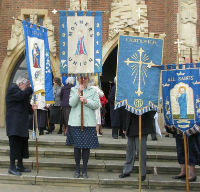 In 2015 we were able to parade with our refurbished banner, it was inspiring parading it among the others in the Diocese. We meet on the second Wednesday of each month at 8pm in the Webber Hall where we frequently have a guest speaker.This is followed by tea/coffee and biscuits and plenty of chat. Do come and join us at any of our meetings and meet our members. If you'd like more information about Mothers Union at All Saints you can contact Mary Brett via email (click here to send an email to her) or for more general information, visit the MU website at www.themothersunion.org .